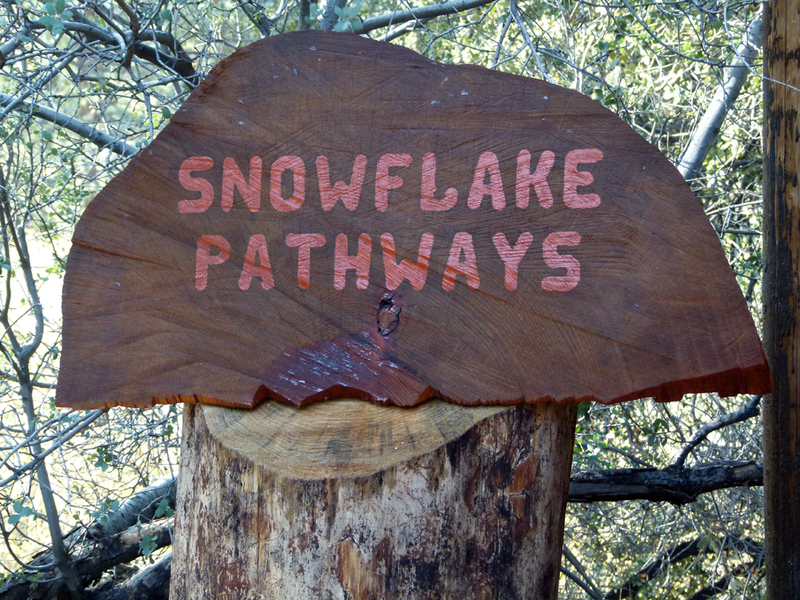 The main entrance to the parkland is located at 2313 Alpen Court (which is a vacant lot next to the Snowflake house). 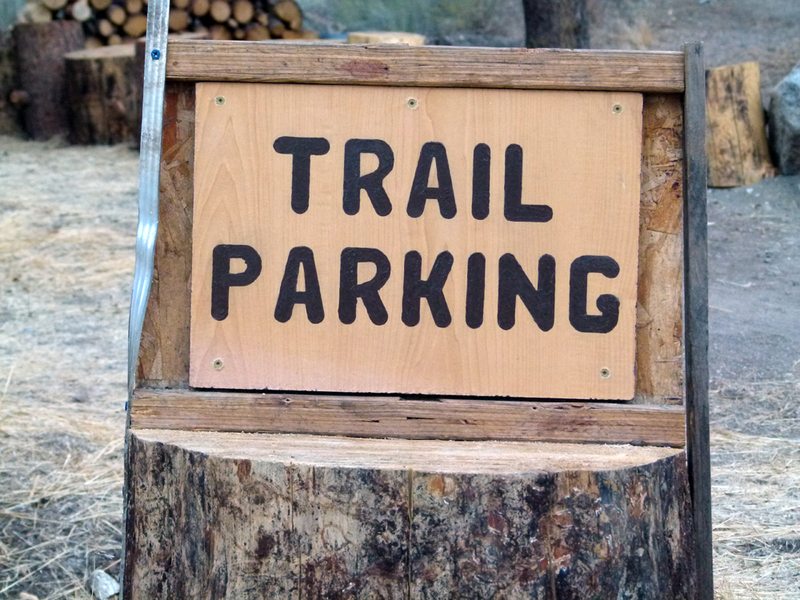 Off-street parking is available (signposted). This entrance is the quickest and most convenient way to enter the heart of the pathway system to enjoy a stroll through the community parkland. (1) ^ ^ ^ As you travel down Alpen Court towards the cul-de-sac, look for this sign on your left near a huge boulder. This is where you enter the parkland. It is the first empty lot on your left (3 houses down from the corner with lower Bernina). (2) ^ ^ ^ Off-street parking is available. 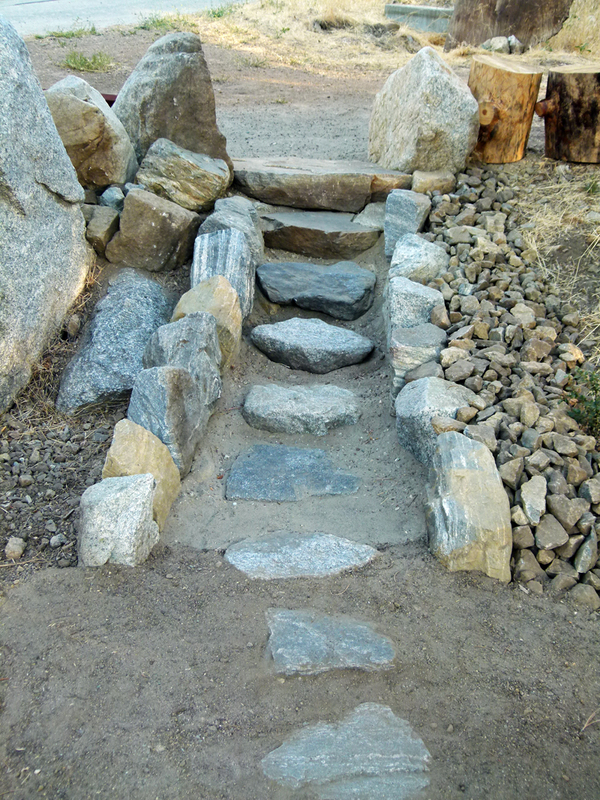 (3) ^ ^ ^ A rock stairway leading from the car park towards the trailhead at the back of the lot. It is easy to bypass (go around) these steps if you have a stroller etc. (4) ^ ^ ^ Walk to the back (right) corner of the lot (following the lattice fence). 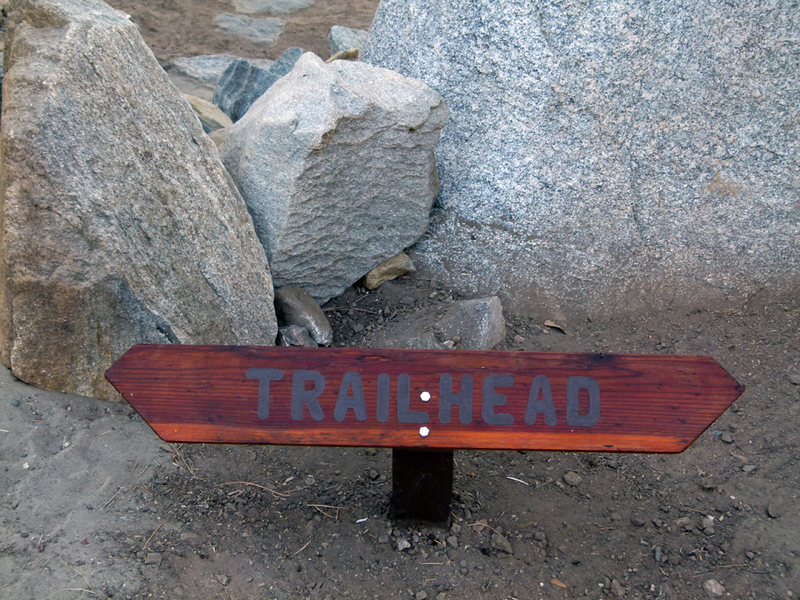 This sign marks the trailhead. (5) ^ ^ ^ Turn left past this sign and walk down the gradual slope towards the greenbelt. Now you are on the main pathway. Enjoy. (6) ^ ^ ^ ^ The beginning of the main pathway. (7) ^ ^ ^ At the first intersection, you can go straight ahead or take a pathway to the left. Turning left takes you on a relaxed stroll along the longest pathway in the network that heads up the greenbelt (south). This pathway joins the service road between the two PMC water tanks #C and #D.
On the opposite side of the greenbelt is another trailhead that crosses an empty lot (with the owner's consent) next to a large house at 2404 Freeman Drive. You can cross the greenbelt between these two trailheads or entrance/exit points as a shortcut to the PMC village center (quicker than driving). 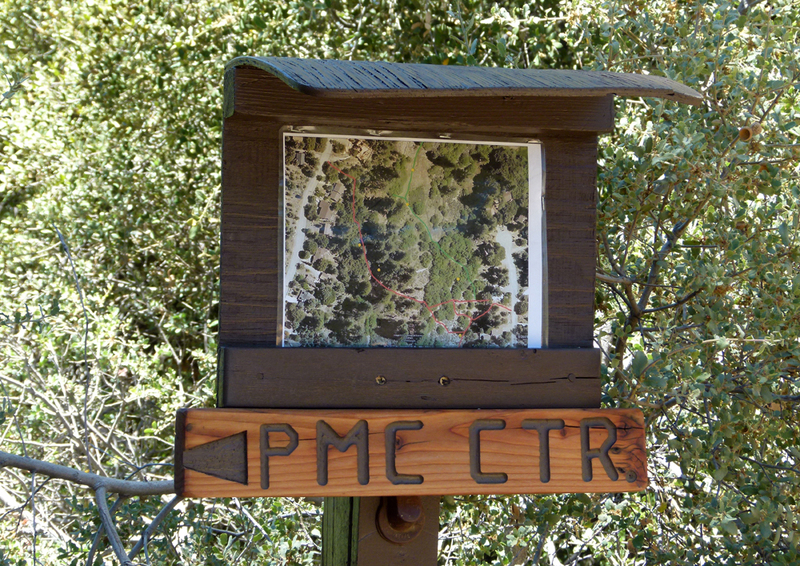 If heading to the Pine Mountain Club village center, both pathways at the first intersection will take you there. The pathways join together again at the 4 Corners which is roughly in the middle of the green belt. 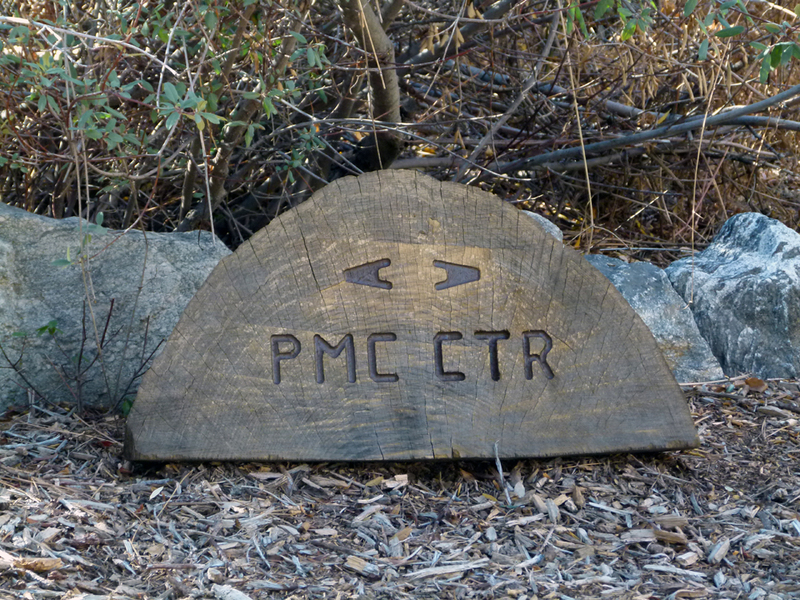 Just follow the "PMC CTR" signs. Both routes are about the same distance (one is not shorter than the other). Going left is more sunny, while going to the right is more shady. Left goes via Victory Circle and the Zen Garden, while right goes over the Wedding Bridge. 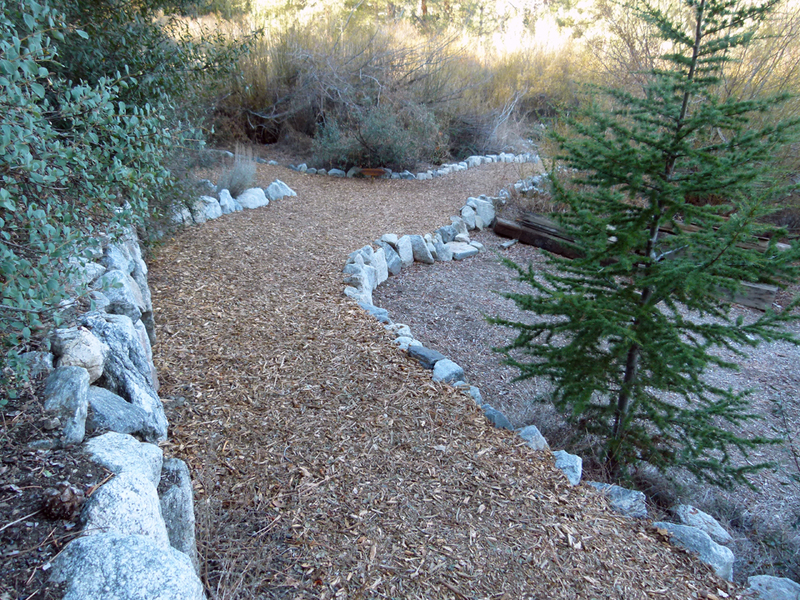 Instinctively, most people go straight ahead probably because that path is wider and perhaps more inviting. You can try both ways for interest and variety. 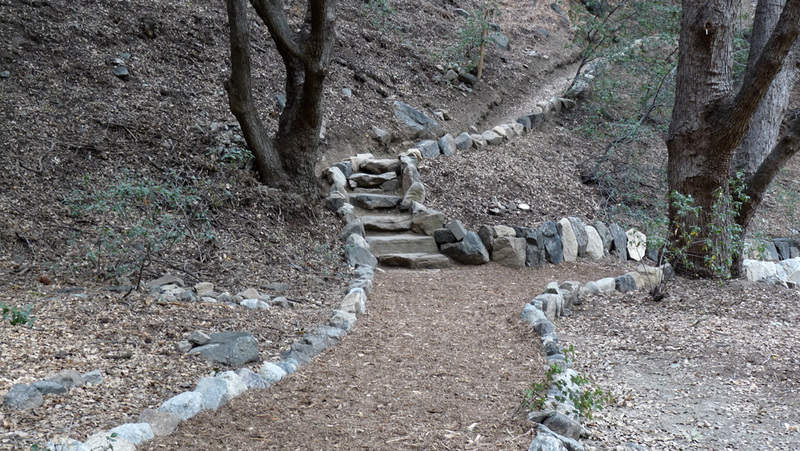 (8) ^ ^ ^ Take this pathway climbing up to Freeman Drive to get to the PMC village center.